learn about interval training for cycling. And how to get it right. Interval training first came to prominence in athletics in the late 1940’s and early 1950s. Roger Bannister the first man to run a mile in under 4′, was an early adopter. Road racing is a highly dynamic sport, utilizing all metabolic path ways, hence historically cyclist unwittingly did ‘interval training’ simply by racing their bikes. However I’m not going to talk about it’s history, I’m going to talk about it’s application in cycling and various types of interval and explain what exactly it is a training plan or a coach seeks to do with interval training. it hurts, it’s difficult, I don’t notice much difference, why bother? With interval training you’re training muscles to work at intensities they aren’t used to, for longer that they are used to. Then they adapt to this higher work load, something that wont happen from training steady state (a continuous, even rhythm). Hence you become faster. One big plus of of interval training is that it’s time economic: train less for the same effect. Interval intensity is usually maximal, that is you go as fast as you can for a given period of time: A better way of thinking about is you try and do a certain amount of work in a set period of time. This means that you don’t go too fast at the beginning that you can’t complete the effort or go so slow the effort is too easy. The rest period in interval training is critical because it also defines the training effect through controlling the rate of accumulation of fatigue. Hence you need to pay attention to both and stick with it as the going gets tough. This brutal session provokes an accumulation of lactic acid (1′ isn’t enough to completely recover from the previous interval). It trains the system that derives energy through anaerobic glycolysis, that is, sugar is burnt without oxygen. Sprint power is provide through two metabolic pathways: ATP present in the muscle (ready energy) which gets depleted after a few seconds, followed by PCr (Phosphocreatine) system, which extend this ‘sprint power’ up to 30′-40′ seconds and is part of the reasoning behind creatine supplements (I personally don’t encourage indiscriminate supplement use of any type). 90″ is the bare minimum recovery period needed for these systems to ‘reset’ ready for action again. Try introducing sprints to your warm up routine. Sprints are an important part of a complete warm up. 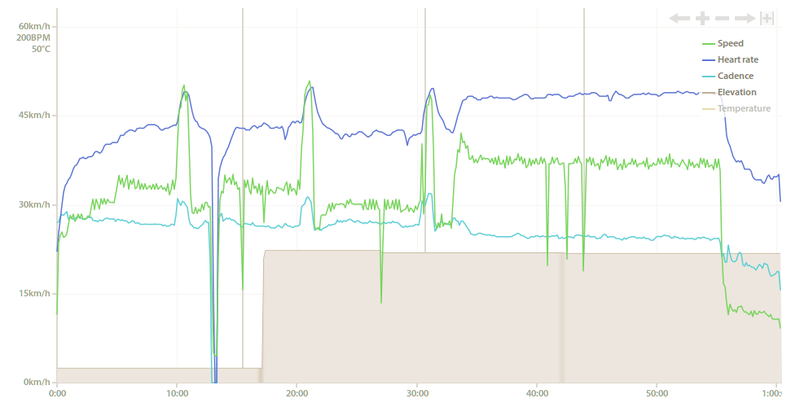 Tempo riding is riding an interval that extends for long periods of type: 40′ -2h. This is good for developing endurance and a lot of people like to train this zone preferentialy. Beware that while this improves endurance, it generally has an opposite effect on power. This trains the ‘aerobic system’ and energy is derived from sugar mostly, but also fat. This is best done in a group, it’s tough alone! These intervals are hard, usually when you see rider racing on the long mountains they are in this zone. It’s the zone that uses sugar nearly exclusively. what interval is right for me? It’s counter intuitive, but interval training is good for people who want better endurance, and speed. So it’s worth including in training for every type of cyclist. Start by developing speed and power with short interval then develop endurance with tempo and lactic tolerance interval. That’s how I do it anyway. Not much. It’s hard going. 2.5- 3 h a week is sufficient, divided into at least 3 sessions (one every 2 days). Before embarking on any training plan I suggest doing a sports medical, to make sure you’re apt for exercise.